Is the outlook actually brighter for solar stocks -- or is it just that the sector has been lost for so long in a dark midnight that even the slimmest glimmer of light looks like a new dawn? Such is the crossroad that solar stocks find themselves at as spring of 2011 approaches. In 2007 -- back when Amy Winehouse was singing Rehab and Juno was a wizard film -- companies making solar modules and panels made up one of the hottest sectors of the stock market. Startup after startup went public and rocketed skyward. In the summer 2008, crude oil futures neared $150 a barrel and solar manufacturers raced to build more factories. But as the fall brought the financial crisis, solar firms became equity pariahs. High borrowing costs coupled with plunging demand made the sector unpopular. The solar dream went cold. As the economy bottomed out, the solar sector seemed left behind. 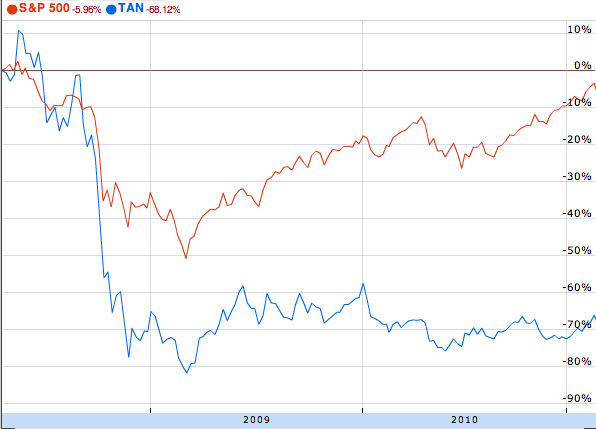 Take a look at this chart comparing the TAN (TAN), an exchange-traded fund of solar-powered stocks against the S&P 500. In the fall of 2008, solar stocks fell much harder than the S&P 500 -- despite the latter's heavy weighting in banking stocks. And since then, while the S&P has clawed its way back over the past two years, the TAN has moved sideways. But so far in 2011, things seem to have reversed. The S&P 500 has gained 4%. The TAN has gained 16%, even rising as much as 23% this month. So, after three years of very mixed fortunes, solar-power looks like it's starting to take off again. Some of the sector's biggest names -- SunPower (SPWRA), First Solar (FSLR), Trina Solar (TSL) and SunTech Power (STP) -- have risen more than 20% so far this year. The tight credit markets on which solar manufacturers rely to fund their new production facilities have eased back open again. And crude oil prices are back above $100 a barrel for the first time since 2008. Stocks of companies making solar-power modules and panels have long been volatile. Solar technology is highly cyclical, according to swings in both supply and demand. Rising demand is positive for solar manufacturers, but as time passes companies rush to build new facilities and expand production capacity. If capacity increases too fast relative to demand, prices tumble. In the long run, lower prices are good because they spur new demand. But in the short-term, it can eat into profits. In that respect, solar modules are a lot like semiconductors. But the demand for solar goods has a complex and often unpredictable relationship with oil demand as well with the willingness of industrialized countries to offer subsidies. The recession that brought oil prices down also forced governments to cut back on alternative-energy subsidies. No wonder, investors grew bearish on the solar sector. Now, however, optimism is on the rise, thanks to recent earnings of solar companies. SunPower said this week it's seeing more demand that it can meet with its solar-panel manufacturing facilities. Oil prices are heading upward, and no one is sure how far they'll go this summer as emerging economies demand more power (not to mention if the Mideast upheavals spread to other oil-producing nations). Rising oil prices can lead to investments in solar-energy projects. But even though solar stocks frequently see a lot of speculative investing and can easily get ahead of themselves, profits could be rising at these companies after their dry spell. So, much of the gains could be based on fundamental strength. For much of the past year, SunPower struggled below $15 a share, a victim of government budget-trimming in Europe, which has historically provided hefty subsidies for alternative energy. SunPower's earnings of $1.36 a share topped estimates of $1.05 a share. 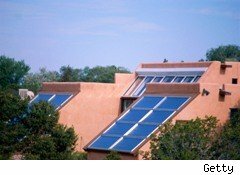 Not only is the company responding effectively to Europe's new austerity but it's increasing its sales in the U.S.
On Tuesday, Trina Solar also reported better-than-expected earnings, delivering $1.87 per American Depository Share, well ahead of the Street's forecast of $1.09 per ADS. Several analysts raised their price targets for Trina, with some noting that demand is surprisingly strong at a time when Trina and others are adding production capacity. All of that follows another bullish earnings report from Yingli Green Energy (YGE), which said last week that revenue grew 66% year-over-year in the quarter. It posted earnings of 57 cents per ADS, ahead of expectations of 44 cents per ADS. Not all solar companies are enjoying the gains. JA Solar (JASO) said Tuesday its earnings per share tripled to 41 cents, but the stock declined after that figure came in short of the 48 cents analysts had been looking for. These stocks have mostly been so strong that some analysts are suggesting investors take profits if earnings push the shares higher. On Tuesday, Pacific Crest analyst Weston Twigg issued a report saying that First Solar could easily beat the Street's estimates for its fourth-quarter earnings. If it does, Twigg said, investors might want to lock in their profits. First Solar's stock now trades at double its peers' price-earnings ratio of nine. But solar module prices may decline by 20% this year. Nothing is straightforward in forecasting the solar industry. In the past, analysts have been too bullish at market tops and too bearish when things were just starting to get better. This suggests that the caution on Wall Street about 2011's solar rally may be overdone. Whether that's true or not, investing in this sector requires a strong stomach -- and maybe some glare-reducing sunglasses.